It may be a craze – it may just be a sign of the times – but furniture on the Costa del Sol is changing! Just 10 years ago the Coast was flooded with everything from pine to ornamental carved furniture and traditional Spanish crafts. Relaxing by the pool meant the old fashioned but very popular outdoor living furniture – it was well made as some examples still exist today! 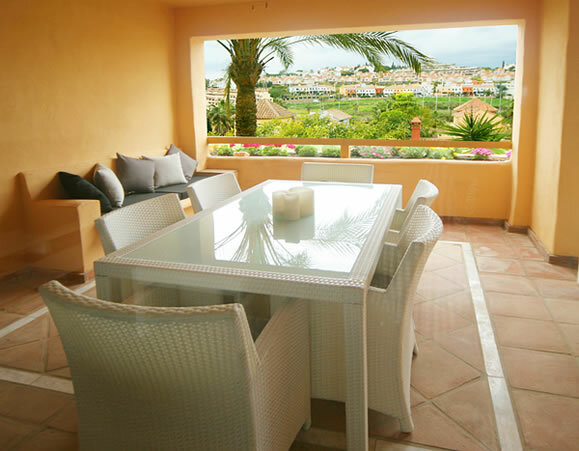 But time moves on and now the furniture market on the Costa del Sol is sophisticated, modern and designed for today’s lifestyle. There has been a huge push towards white furniture, especially high-gloss furniture. This is not only seen in the living areas but also extends to outdoor living where clean white lines are the current fashion. Outdoor sofas, terrace sets and relaxers are showcased in modern white design, all-weather rattan and even aluminum. Inside the home, high gloss tables and chairs, dressers complement white sofas. The bedroom does not escape with beautiful nightstands with clean modern lines and headboards to match. What has bucked this trend to a new style of furniture for the Costa del Sol? The obvious answer is the popularity of the furniture with Northern Europeans who are very used to this type of furniture in their domestic market. It’s a natural progression to look for what we like for our second home. Many Scandinavians are requesting this type of furniture as the only way forward when making the decision to furnish a home abroad. Mad About Furniture are one such store who have embraced this new concept and have enjoyed loyal customs from their friends from countries such as Holland, Norway, Denmark and Sweden. As well as practicality, the high-gloss white furniture is easy to clean, looks smart and suits the light and summer feel of the Costa del Sol. It’s quite different from the way homes can be furnished in colder climates such as the UK, where, fabrics, rugs and soft furnishings are used heavily to give the home a warm feel. Leather and imitation sofas have become important in the market for similar reasons. They are practical, hardwearing and modern. The white is a strong clean colour and suits the hot climate of the Costa del Sol (Although the second favorite happens to be brown!). It’s unusual to pass a store like Mad About furniture in Estepona and not to see a white sofa taking pride of place in the store as it is usually the starting point of any furniture purchase. Not only are these sofas available from top quality companies in Italy, it is now perfectly possible to suit every budget with sofas in white, available from stock made as far afield as China. It seem unfair to call this white revolution a phase. It’s a progression caused by a number of reasons and consumer led. 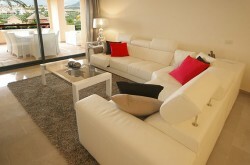 For this reason white furniture will continue to feature heavily in the stores of the Costa del Sol. Mad About Furniture have a bespoke package based on white high-gloss furniture. Although it can be adjusted up or down in price, a well appointed apartment can be furnished in the white theme for just 9999 euros. The choices are endless and continue to get bigger every day! This white furniture is gorgeous . In the heat of the costa del sol the white will keep it cool so when you go to sit on it your not burning your behind !